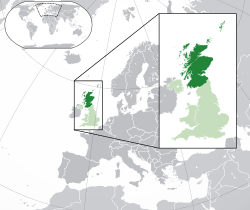 Scotland (/ˈskɒt.lənd/, muChiScottish Gaelic: Alba [ˈal̪ˠapə]) inyika iri muUnited Kingdom. Nyika iyi ine miganhu neEngland. This page was last edited on 17 Nyamavhuvhu 2016, at 20:12.